The proposed Rand Water Bronberg Reservoir and associated infrastructure on the sensitive Bronberg ridge area is going ahead amid strong protests. The project, which was suspended for longer than a year, was approved by the Department of Environmental Affairs late last year. Appeals against the project had to be handed in by 11 December. In July 2016 we reported that Rand Water planned to build a 100 mega litre (ML) reservoir and associated infrastructure on the Bronberg ridge where the critically endangered Juliana Golden Mole lives. Rand Water is proposing to install the 100 ML reservoir next to its existing reservoir on the Bronberg ridge on property that belongs to Rand Water. The proposed development will be on portion 18 as well as the remaining extent of Tweefontein Farm 372 JR, located between Olympus and Shere. This reservoir project was suspended in 2016 because Friends of the Faerie Glen Nature Reserve alleged that they have reason to suspect that the environmental assessment practitioner, Nemai Consulting, had not met the requirements of independence in preparing the draft report or when conducting the public participation process in connection with it. The Friends’ suspicion was based on the lack of independent or reliable assessment of alternative sites and failure to provide information on alternative access routes considered. It was also based on failure to disclose information on the southern access to the site and failure to disclose information on the overflow-drainage pipeline and alternatives as well as the focus of the draft report and bias during the public meeting. According to environmental regulations, the Department of Environmental Affairs had to investigate these allegations and no activity on the project could start. A revised draft basic assessment report was made available nearly a year later in June 2017 and a public open day was held. The final report saw the light in August 2017 and again the Friends submitted their objections to the Department of Environmental Affairs. “And then, at the end of November 2017, we received the shocking news that the project was approved and that we had to hand in our appeal by 11 December,” said Louise Kritzinger, chairman of the Friends. Route one approaches the site from the south from Atterbury Road. Route two approaches the site from the south from Hans Strijdom Drive (Solomon Mahlangu). Route three approaches the site from the north through Shere from Hans Strijdom (Solomon Mahlangu Drive) and Lynnwood Road extension (Graham Road) via Struben Road. Route four approaches the site from the north through the Wapadrand area from Hans Strijdom (Solomon Mahlangu Drive) and Lynnwood Road extension (Graham Road) via Frank Avenue, Catherine Road and James Road. Route five approaches the site from the north through Shere from Hans Strijdom (Solomon Mahlangu Drive) and Lynnwood Road extension (Graham Road) via Struben Road, Catherine Road and James Road. According to the project’s updated traffic assessment and stormwater review, routes one and two would not be feasible as the current access to the Rand Water reservoir does not allow enough space for heavy vehicles to turn. According to the Friends’ appeal, the existing gravel track on the northern slope of the Bronberg ridge runs through the sensitive Bronberg mountain bushveld, which is a critically endangered ecosystem. The track’s upgrade will involve a variety of environmental impacts whereas the southern access route will not lead to these impacts. According to the Juliana Golden Mole specialist assessment for the proposed development, the northern routes for temporary access roads run through areas with high densities of golden moles on the slope of the Bronberg, which is considered a high priority area for the conservation of this species. The assessment states that the reservoir project is likely to lead to the destruction of this highly threatened red data listed species in the area where the reservoir will be erected. According to the Friends’ appeal, the terrestrial ecologist provides no assessment of cumulative environmental impacts, despite the impacted area falling within this endangered ecosystem, which is already subject to heavy habitat degradation and under pressure from residential and infrastructure development. The Friends also pointed out that the 200 metre ridge buffer zone was not reflected on any of the maps provided. 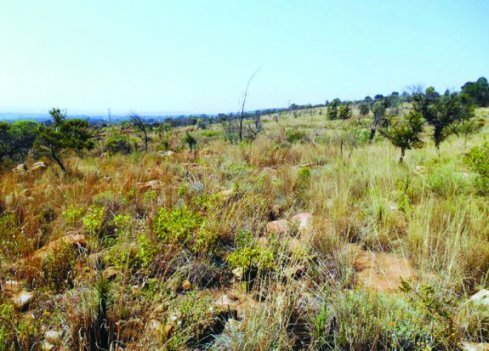 Their appeal states that the activities will fragment a large undivided section of the critically endangered ecosystem on a class two ridge known as the Bronberg Mountain Bushveld. The site forms an important east-west corridor for species migration. The construction activities would cut right through this corridor of species movement, lead to the death of a large number of moles and jeopardise its continued survival. The sensitive floral habitats or red or orange listed species were not shown on the applicant’s map, stated the Friends. The red listed Ceropegia decidua subsp pretoriensis has been found on the site and within the construction footprint of the planned road. This means that a buffer zone of at least 600 metres from the edge of the population must be allowed. According to the Friends, the basic assessment report fails to properly assess the southern access routes and southern pipeline options. The Friends propose that the southern entry point be modified to allow for a bigger turning circle for large trucks. This entails Rand Water acquiring a right to use a corner of the abutting property, owned by the Seventh Day Adventist Church. “It can clearly be done,” stated the Friends. The Friends requested details of the negotiations between Rand Water and the church, but none has been given and they wonder whether Rand Water explained sufficiently that the southern access option was important for the preservation of a critically endangered ecosystem. According to the Friends, it has become apparent that Rand Water has failed to properly prepare for the future construction of the second reservoir. No plans were made to access the site or to acquire the necessary servitude for various parts of its infrastructure, such as servitudes for pipelines. The proper space was not secured for accessing their own entrance located on the southern side of the Bronberg Ridge, said the Friends. Rand Water has not kept track of the development that took place in the area, which has lead to houses being built on the overflow servitude on the south. “While the properties adjacent to their access gate are still undeveloped, they should use the opportunity to acquire the land not only for the temporary use for the construction of the second reservoir, but for permanent future access,” the Friends said.